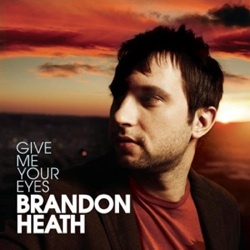 "Give Me Your Eyes" is a song by contemporary Christian musician Brandon Heath from his second album, What If We. It was released in July 2008 as the album's lead single and quickly gained success. It sold nearly 6,000 downloads in the first week, and became 2008's highest-debuting Christian track at the time. It soon placed at No. 1 on Christian radio charts, and held the position for multiple consecutive weeks.